U.S. Presidential candidate Julián Castro, who was Secretary of Housing and Urban Development in the Obama administration, will be the keynote speaker at the Fresno County Democratic Party’s May 3 fund-raiser. “We are thrilled to host a Presidential candidate in the Central Valley. Julián Castro has an impressive resume and a track record of public service,” says Michael D. Evans, chair of the Fresno County Democratic Party. What are your thoughts on climate change? Amy isn’t taking money or support from corporate PACs or federal lobbyists, so she relies on the strength of her grassroots team. Here’s something you should know about Amy: She believes in science. That’s just irresponsible. As president, Amy would make fighting climate change a top priority. That’s why she’s committed to rejoining the International Climate Change Agreement on day one of her presidency. Take our quick survey and tell us your thoughts on climate change. Please note: this email contains language that may trigger feelings of trauma related to gun violence. Twenty years ago, two Columbine High School students murdered twelve peers and one teacher. Two decades later, the rate of school shootings has increased. In 2018, there were more incidents of gun violence and more gun deaths at schools than any other year on record. In no other developed nation do students face these unprecedented levels of gun violence in their schools. Will you help celebrate Cory’s birthday? One of the best parts about being a member of Team Cory is that community service is woven throughout everything we do — including the boss’s birthday. So, when Cory proposed we celebrate his big 5-0 with a day of service, we couldn’t wait to invite you. That’s why we’re asking you, as one of our best supporters, to host a 50-minute (or longer!) community service event in your neighborhood next Saturday. We’re calling it “50 for 50”. Help give Cory the best birthday gift he could ask for by organizing a group of friends and giving back. Sign up now. Knowing Cory, none of this will come as a surprise to you. He’s always been dedicated to serving his community in any capacity he can. When Cory graduated from law school, he started his career in Newark to work as a tenants’ rights lawyer alongside some fierce local advocates. I’m passionate about legalizing marijuana because to me, it’s a basic question of fairness and freedom of choice for the American people. And since 60% of voters support legalizing pot, it’s clear that the American people agree. It appalls me that marijuana is considered a Schedule 1 drug, alongside heroin, and that our country arrested 600,000 people just for possession in 2017 alone. Meanwhile, Big Pharma gets off scot free for pushing highly addictive opioids on to patients who don’t need them. Justice means expunging the records of those with marijuana possession charges and fully prosecuting Big Pharma for fueling an opioid epidemic that has killed thousands. If you’re getting this email, I believe you want my kind of common sense, bipartisan approach — on marijuana, Medicare, education and foreign policy — leading our country. Will you make a donation TODAY on 4/20 to support common sense marijuana policy in the White House? Hello and thank you for your support! It means everything to us. Our latest rally was Thursday night in Atlanta—more than 1,000 amazing people came out. We made many new friends; the Humanity First Tour is a blast and getting bigger and better as we grow. The rally was covered in the Atlanta Journal Constitution the next day. One benefit of the Tour is all of the press we have been getting at each stop. A couple people have run analyses of the number of press mentions and articles about different presidential candidates. Perhaps not surprisingly, I am in last place. Fwd: Happy Easter! Feliz Dia de La Pascuas! Subject: Happy Easter! Feliz Dia de La Pascuas! I’m Mayor Barrett, and I’m incredibly thrilled to welcome all of America to the 2020 Democratic National Convention in Milwaukee next year! Next July will be the first time in our history that we’ll host a major party’s convention, and as a city, we could not be more proud of this opportunity to show America what our great city has to offer, and what makes us all proud to call ourselves Milwaukeeans. I see the City of Milwaukee as a microcosm of our nation. We’re working class people with working class roots who represent diverse backgrounds and histories. This community is proof that when Democrats come together and put in the hard work it takes to win elections up and down the ticket, the lives of everyday people and families are better off for it. The Democratic Party has a tremendous amount of work ahead of us to prepare for 2020. From planning the convention here on the ground, to hosting fair and transparent debates, to building the strong party infrastructure it’ll take to win the White House and seats nationwide, our party truly can’t get this done without the early support of grassroots Democrats like you. The fight for 2020 will be the fight of our lifetimes, Michael, which is why I’m asking you to join this powerful movement to elect a Democratic president and win seats in all 50 states next year. My plan to put more money in your pocket. So many Americans find themselves with more month at the end of their money than money at the end of their month. The cost of everything — from rent to prescription drugs to childcare — seems to be going up, but wages are virtually flat. The truth of the matter is, right now, we have a tax system that is unfair to workers — and this administration is working hard to make it even worse for everyone other than the wealthiest Americans and the biggest companies. I’ve had enough of President Trump’s idea that if we give the richest among us tax breaks, then somehow that’s going to help us all. It’s nonsense. I have a plan to cut taxes for more than half of all Americans. The Rise Credit would benefit millions of working and middle class people, not just the wealthy few. If you think it’s time to start putting more money in the pockets of working and middle class Americans, add your name now. Beto just traveled across New Hampshire as part of his trip to listen to Americans across the country — but there is no way he can personally reach all of the voters we need to win this election. That means he needs your help now. With the Mueller report out yesterday, the urgency of uniting a massive, grassroots movement to stop another Trump presidency and elect a new president who will protect democracy is clear. We need more volunteers stepping up to talk to voters. Direct voter contact is the best way to ensure we do not see another four years of Trump. People need to hear about our vision for the country. Add your name if you’re interested in knocking on doors and talking to voters in your neighborhood. We’ll provide all the support and info you need. Fresno Democratic — On Monday, Amy is participating in her second CNN Town Hall and we think you’ll want to tune in! Amy will be taking questions from voters and laying out her plans to move our country forward. From curbing climate change to rebuilding our infrastructure to making sure everyone has the right to vote — Amy is leading the way. Let Amy know you’ve got her back and that you’ll be watching on Monday, April 22 at 6 CT/7 ET during her CNN Town Hall. I want to make sure you know where I stand. Can you make a donation to our campaign today? The political and financial establishment are plotting against us, so it’s important that our campaign is prepared to take them on and win. Bernie can’t do it alone. This is a campaign with all the momentum. More than 1 million people have signed up to volunteer. We are a campaign funded almost exclusively by a record number of small-dollar donors. And on April 27, supporters will host more than 5,000 organizing kick-off events. But our strong start in this race has members of the political and financial establishment plotting against us. Make a donation to our campaign and we are going to win this nomination, defeat Trump, and transform this country. Our campaign is truly rising. Thank you Silicon Valley Dems and Sunnyvale Dems! We came in second place on the endorsement votes just proving that our campaign message is resonating with the delegates! Thank you to the various delegates, supporters and leaders sending words of support and encouragement to our campaign. Your encouragement and support is appreciated! Unlike President Trump, I will not turn our great country into the prostitute of Saudi Arabia. By vetoing the War Powers resolution that would have seen the US finally end its support of Saudi Arabia’s genocidal war against the people of Yemen, Trump again proves that he is the servant of Saudi Arabia — the theocratic dictatorship which spends billions of dollars every year spreading the most extreme and intolerant form of Islam around the world, the very ideology that motivates al-Qaeda and other jihadists. Trump’s veto of the War Powers Act is further a betrayal of his campaign promise to end “stupid wars.” Trump is caving to the neocons around him who are fomenting regime change war in Venezuela and Iran and escalating the new Cold War and nuclear arms race. These wars have and will continue to waste trillions of dollars and thousands of American lives, undermine our national security by strengthening terrorist groups like ISIS and al-Qaeda, and cause untold suffering and devastation for the people in the countries where we wage these wars. 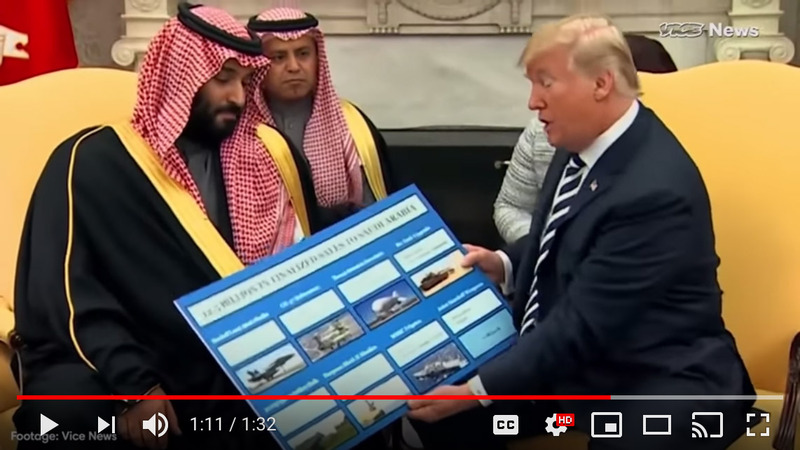 1) Watch this video where I explain how, because of the actions of President Trump, the U.S is complicit in the genocide that the theocratic dictatorship of Saudi Arabia is waging on the people of Yemen. And then share it with your friends to get the word out about what this veto really means. This is a longer email about how the DNC is organizing earlier in the cycle than ever before. You and I both know that we can’t treat this presidential election cycle as business as usual, Michael. Good morning — my name is Muthoni, and I’m the DNC’s new National Political and Organizing Director. I came to the DNC because the importance of this election cycle can’t be overstated. Families across our country are hurting, and this is our final chance to vote out Donald Trump and his GOP enablers before the 2020 redistricting process re-shapes our political landscape for the next decade. The DNC has never invested in organizing for the general election this early in a presidential cycle. We’re leaving it all on the field, but in order to do that, our party needs the early resources necessary to power the essential programs it’ll take to organize and win in all 50 states. We have unfinished business in the states. It’s on all of us to unite people with the common thread of our values, to organize alongside local communities, and to put our eventual 2020 Democratic presidential nominee and the Democratic candidates running for seats across our country in the best possible position to win.